CarGurus has 6,208 nationwide CLA-Class listings starting at $12,799. Entering its third model year since inception, the 2016 Mercedes-Benz CLA-Class continues to serve many purposes for both the company and Mercedes customers. The CLA is the “entry-level” Mercedes-Benz here in the U.S. market, and one of its jobs is to advertise a very low entry price. Another job it has is to combat the growing list of rival models that have been stealing its potential sales with cheaper-to-build, front-wheel-drive platforms. And, of course, the CLA must make the consumer happy, which it does best of all. Mercedes-Benz advertises the CLA as a “coupe.” It is not a coupe, however, but rather a four door sedan built to have a look similar to a coupe. Capable of carrying five people, and built with either front-wheel drive (FWD) or all-wheel drive (AWD), the CLA is a compact car stretched to its largest limits--or a small mid-size, depending upon your viewpoint. Either way, it's the perfect vehicle size for a single person or a couple who sometimes carry friends. The CLA’s exterior styling is aggressive, starting with the a humongous Mercedes three-pointed star up front. That star, in fact, is important to many buyers, and they want it to be prominent (it can even be illuminated for those who want to be easily seen in their Mercedes at night). The front looks very sporty, the sides are plain but handsome, and the roofline strikes an arch. The CLA was a clean-sheet design for Mercedes when it introduced the car back in late 2013, meant to have a similar look to larger Mercedes models. And it works. In person, the car is truly a looker. Inside, the CLA has a dash design that is similar in ways to that of the Audi A3 and the Mazda3. It features prominent air vents and an infotainment screen that sits right on the dash, rather than being integrated into it, which is currently the fashion in German vehicles. The driver and/or passenger can control the screen primarily by a remote rotary mouse of sorts. The bucket seats are clearly intended to look sporty, and interior trim is available in old-school wood, as well as aluminum, sport aluminum, and anthracite, which seem more fitting for the CLA's character. Mercedes will build its 2016 CLA class three ways. The base model car is the FWD CLA 250, powered by a 2.0-liter turbocharged 4-cylinder engine producing 208 hp and good torque at low RPMs. Next up is the CLA 250 4-Matic, which adds AWD. Then there is the AMG CLA45, which has a “handcrafted” 2.0-liter turbo tuned to a whopping 375 hp for 2016 (up slightly over the prior two model years). The AMG CLA45 is only available with AWD. All CLA-Class models use a 7-speed automatic transmission. Reviewers of prior year models say the CLA250 is rather firm in its ride but tuned to be sporty. The turbocharged engine will zip the CLA250 from 0 to 60 mph in a very respectable 6.9 seconds, giving a V6 Camry or Accord a run for its money. The AMG CLA45 is a rocket with a sport-car firm suspension, able to launch form 0 to 60 in an amazing 4.1-seconds, considered supercar territory only handful of years ago. Being the entry-level Mercedes-Benz, prices matter a lot for the 2016 CLA250. A base model car will be attainable for around $33,000. 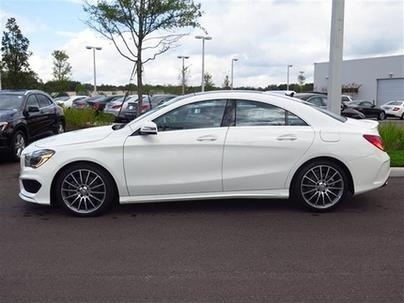 However, an AWD CLA250 4-Matic with the cool-looking Night Package, the Multimedia Package, Premium leather seats, and forward collision prevention with adaptive cruise control, all options that would be expected in a premium car, approaches $50,000. The 2016 AMG45 will start at about $51,000, nearing $60,000 with all the options listed above. Great fuel economy is the final mission of the 2016 CLA-class. Here the base car delivers, with an excellent 30 mpg combined rating. 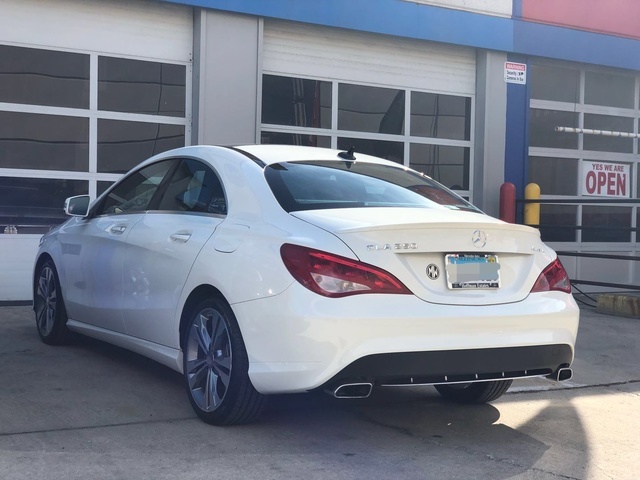 The AWD CLA250 4-Matic earns a respectable 27 combined, and the powerful CLA AMG45 posts a 26 combined figure that is outstanding given its performance abilities. The Insurance Institute For Highway Safety has not yet crash tested the CLA-Class, but with its forward collision prevention system, the Mercedes could qualify for the top rating if it does well in the small frontal overlap test, which most manufacturers have by now figured out. The 2016 Mercedes CLA-Class offers quite a range of content and an equally broad price range. Mercedes-Benz deserves credit for bringing a car to market that will welcome more buyers to its family and give those with a generous budget just one more in a long list of amazing choices that have the AMG stamp of approval. What's your take on the 2016 Mercedes-Benz CLA-Class? TheHorror If the only part of a car that you care about is a badge, accept no substitute for the CLA. It is distilled social posturing! Users ranked 2016 Mercedes-Benz CLA-Class against other cars which they drove/owned. Each ranking was based on 9 categories. Here is the summary of top rankings. Have you driven a 2016 Mercedes-Benz CLA-Class?